Meggendorfer was born in Munich and studied with Strähuber, Anschütz, and W. van Dietz. He is famous as a creator of illustrated children's books with movable parts: by the time of his death he had illustrated over 100 books, some of which were also published in the U.S. (For an illustrated list of some of these, see http://www.lib.virginia.edu/exhibits/popup/meggen.html; for additional titles, see http://www.alephbet.com/meggendo.html, which advertises his books at prices ranging from $150 to $9500.) Though best known for his mechanical toy-books for children, with rotating wheels, slat-transformations, or pop-up pictures, Meggendorfer was a master illustrator who also worked on magazines, pictorial almanacs, and non-moveable picture-books. In 1886 he founded the Meggendorfer Blatter (The Meggendorfer Journal) and published his writings and often satirical illustrations there. The Munich Municipal Museum has a collection of his drawings. Select Bibliography: Waldo Hunt and Maurice Sendak, The Genius of Lothar Meggendorfer (London: Jonathan Cape, 1985); Lothar Meggendorfer, A Doll's House: A Reproduction of the Antique 1890c. Pop-up Book (New York: The Metropolitan Museum of Art, 1979); David Pelham, The Genius of Lothar Meggendorfer: A Movable Toy Book illustrations by Jim Deesing after Lothar Meggendorfer, paper engineering by Tor Lokvig: Illustrates the work of the 19th century artist considered to be the greatest innovator in the field of moving picture books (NY: Random House Inc., 1985). Horse and stage preparing to depart. 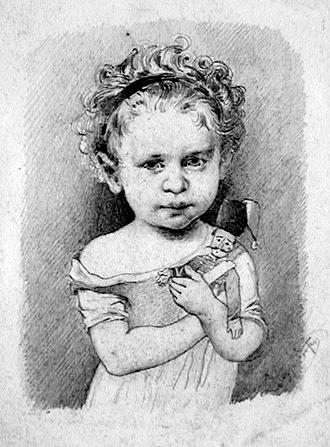 Pencil on wove paper, last third of the 19th century. Heavily over-written with notes, suggesting that another version followed. Attributed to Meggendorfer on the verso. Image size: 138x201mm. Price: $450. 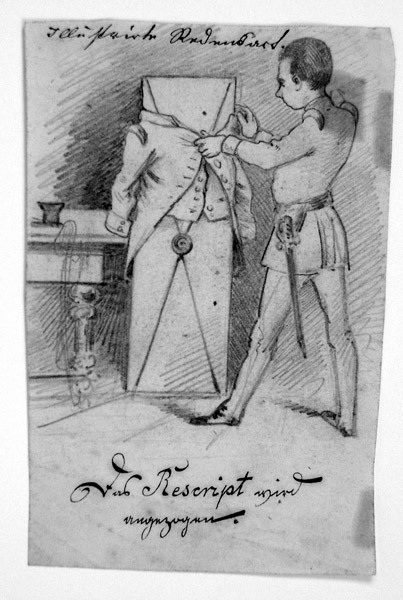 Soldier putting a coat on a giant envelope. 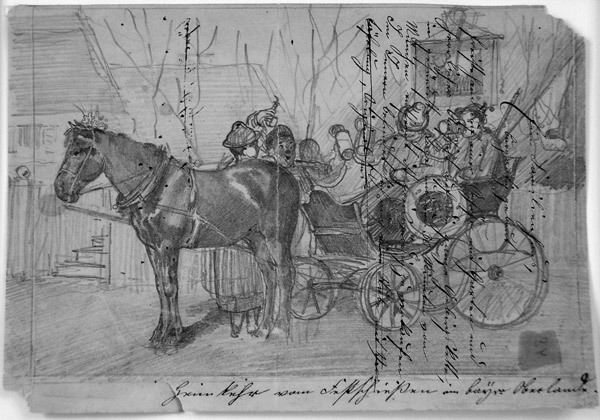 Pencil on wove paper, last third of the 19th century. This drawing is evidently topical in nature. Attributed to Meggendorfer on the verso. Image size: 124x84mm. Price: $750.